In the past, if you needed a small, portable camera, you might sacrifice important features like zoom. In the past, if you needed a small, portable camera, you might sacrifice important features like zoom. With the Sony DSC-HX90V, you don't have to. 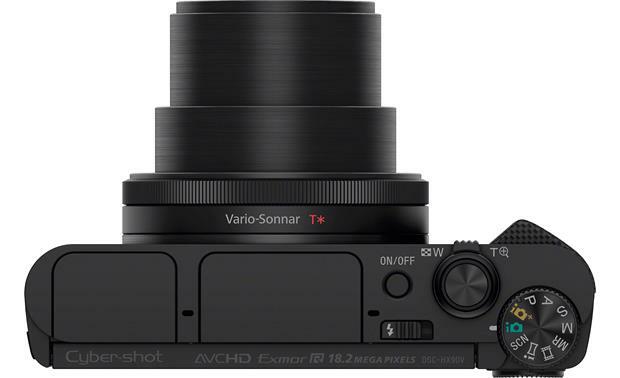 The camera's built-in Vario-Tessar lens offers a stunning 30X optical zoom — very impressive range for a camera that can fit in your pocket. We're also impressed with the image quality the 'HX90V offers, thanks to its high-performance Exmor R image sensor and a powerful Bionz X processor. 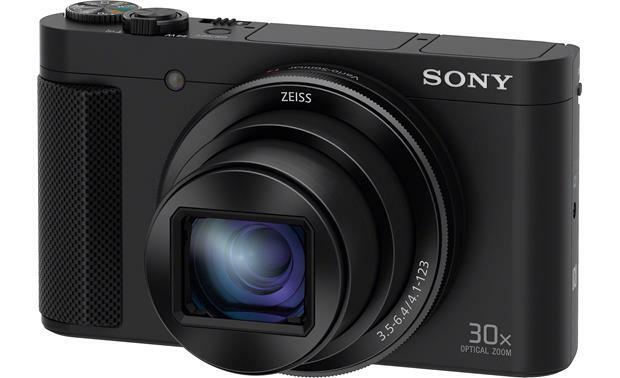 The Sony DSC-HX90V with OLED viewfinder is a pocket camera with 30X optical zoom. 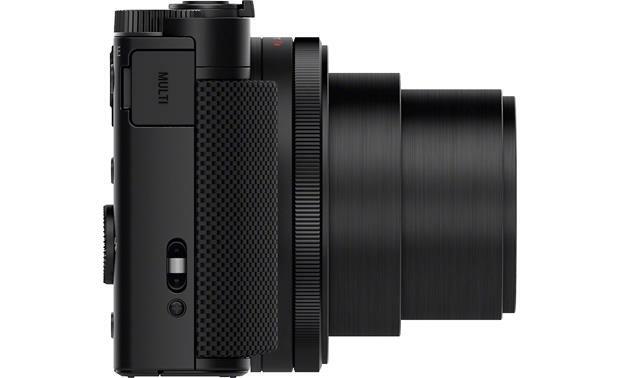 You'll have no problem locating, framing and photographing your subject, thanks to the 'HX90V's built-in popup OLED viewfinder. The camera's bright, tiltable 3" LCD screen lets you see what's happening even when you're taking a selfie. Any high-zoom camera needs powerful image stabilization to ensure your close-ups aren't blurry. Those subtle movements of your hand may not seem like much, but they can wreak havoc when you're zoomed in from long distances. 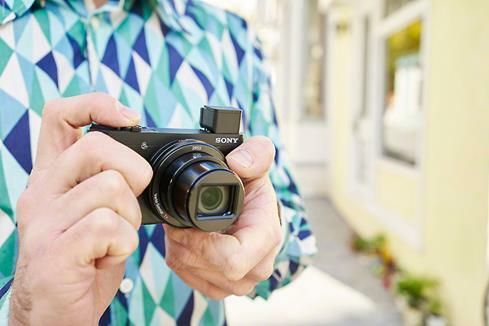 Sony's optical SteadyShot stabilization employs a unique twist: it corrects for rotational movement of the camera. So your photos are more likely to be sharp and crisp, whether you're shooting wide-angle shots or long-range close-ups. There's even more to explore with the DSC-HX90V's many features. On-board GPS tracks your location and tags photos, so you'll know where and when each shot was taken. Capture fast action sequences at the blazing speed of 10 frames per second at the camera's full resolution. Shoot HD video at the same time as you capture still shots. And a wide array of shooting options, digital filters, and editing options will help you craft photos you'll be proud to share with family and friends. weight (with battery and memory card): 8.6 oz. I've shot about 3 dozen photos and found the quality to be very good. The camera has all the features I wanted and I've used many of them already. The retractable electronic viewfinder is especially useful for sunny outdoor shooting. where to get drivers to download pictures to my computer? 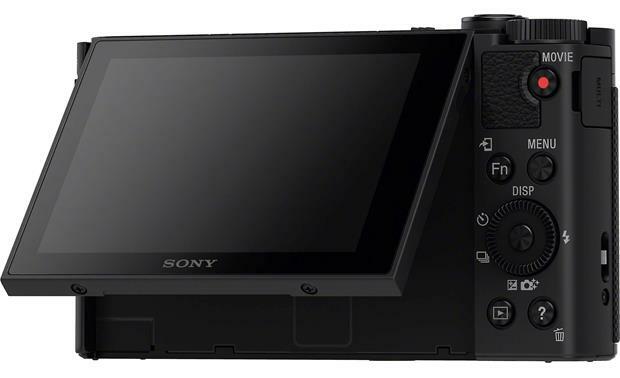 Google "Sony Camera Drivers" or "Sony DSC-HX90V Drivers"
3" LCD Screen: The Sony Cyber-shot DSC-HX90V digital camera has a 3.0" XtraFine LCD screen with 921,600 dots. The LCD screen can be rotated upward for framing low angle shots, or all the way to 180° for self-portraits. Once the display is raised above 90°, the image flips so you'll see your image in the right orientation. The LCD brightness control can be set between -2 (dark) and +2 (bright). Pop-up OLED Viewfinder: In addition to the 3" LCD screen, the camera has an OLED Tru-Finder viewfinder with approximately 638,400 dots resolution. To use the viewfinder, you'll need to use the pop-up switch on the side of the camera, and pull the eyepiece out. A -4.0-to-+3.0mˉ¹ diopter lets you adjust the viewfinder to your eyesight. As you raise the camera to your face, a sensor automatically switches the camera to the viewfinder, and will switch back to the LCD monitor when you pull your face away from the camera. The camera will turn on when the viewfinder is raised, and will turn off when lowered. Recording Media: The camera is compatible with the following recording media: Memory Stick XC-HG Duo, Memory Stick PRO Duo (Mark 2 only for movie recording), Memory Stick Pro-HG Duo, SD, SDHC, and SDXC memory cards (Class 4 or faster). When recording movies in the XAVC S format, only SDXC memory cards with a Speed Class 10 or UHS Speed Class 1 or faster are recommended. The HX90V is also compatible with Eye-Fi cards, which allow you to upload your photos using Wi-Fi. MP4: MPEG-4 AVC/H.264 video with MPEG-4 AAC-LC 2ch audio. Image Sensor: For optimal image quality, the camera uses a 1/2.3" color Exmor R CMOS image sensor with approximately 21.1 Megapixels total and 18.2 Megapixels effective. Optical SteadyShot: Optical SteadyShot can provide blur-free movies and still images. Camera-shake compensation using Optical SteadyShot has been improved with the addition of new electronic image stabilization, 5-axis stabilization, and advanced frame analysis technology. This makes it easier to obtain sharp movies, even when zooming in unsteady situations. There are three levels of SteadyShot available: Standard, Active, and Intelligent Active. Motion Shot Video: The Motion Shot Video feature lets you see the tracking of the subject's motion in high-speed, like a stroboscopic image. You cannot save the images made with Motion Shot Video as a movie file. It is simply a playback feature. GPS: The HX90V is equipped with a GPS sensor that receives location information from overhead global positioning satellites. Using PlayMemories Home software (downloadable from Sony), you can use the location data to display your photos on a map showing their shooting location. 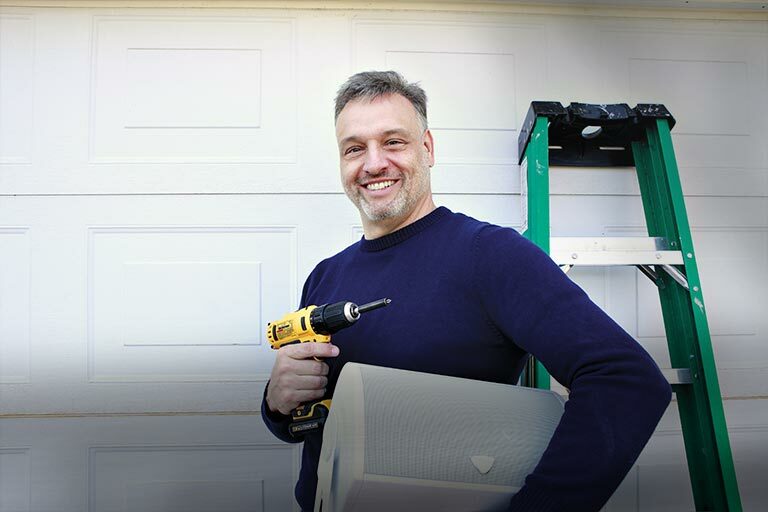 Even with the camera turned off, you can track and log your location for up to 24 hours. Continuous Shooting: The camera shoots continuous images while you press and hold down the shutter release. Up to 10 continuous frames can be recorded in a single burst at approximately 10 frames per second (Hi speed) or 2 frames per second (Lo speed). Self-Timer: You can set the Self-Timer mode to a 10-second delay so you can be in the picture. A 5-second delay is also available. The self timer with a 2-second delay can help prevent blurred pictures from camera shake. Self-Portrait: With the monitor tilted upwards 180°, the Self-Portrait Timer mode will capture the image 3 seconds after you press the shutter button. Self-Timer Continuous: The Self-Timer Continuous shooting mode takes 3 frames in succession after a 10-, 5-, or 2-second delay. Continuous Bracket: The Continuous Bracket mode lets you shoot a series of 3 images, each with a different exposure setting--one at normal exposure, one under exposed, and one over exposed. You can select from five different step values: 0.3EV, 0.7EV, 1.0EV, 2.0EV, or 3.0EV. The shutter button is pressed and held down until the bracket recording is completed. Single Bracket: The Single Bracket mode is like the Continuous Bracket, except the shutter button is pressed and released for each image. WB Bracket: The White Balance Bracket mode shoots three images, one with the current color tone, one with the white balance shifted toward blue, and another toward red. WB Bracket Low records the images with small changes in the white balance, while WB Bracket Hi records the images with large changes in the white balance. DRO Bracket: The D-Range Optimizer Bracket is like the White Balance Bracket, except each image has a different degree of DRO value. Multi Frame NR: The camera can automatically shoot multiple images continuously, combine them, reduce the noise, and record them as one image. Multi Frame Noise Reduction allows you to select larger ISO numbers than the maximum ISO Sensitivity. Wide: The camera focuses in all ranges of the finder frame automatically. When you press the shutter button halfway, a green frame is displayed around the area that is in focus. Center: The camera focuses on a subject in the center of the frame. By pressing the shutter release halfway, you can lock the focus on your subject and recompose your shot with the subject off center. Flexible Spot: The camera focuses on a very small area, which can be moved around within the frame. Expand Flexible Spot: If you cannot achieve focus on the single selected point, the focus points around the flexible spot are used as the second priority area to achieve focus. Lock-on Auto Focus: If you are trying to photograph a moving subject, you can use the Lock-on Auto Focus feature to keep the subject in focus as it moves around the frame. AF Illuminator: The AF (auto focus) Illuminator briefly provides fill light to focus more easily on a subject in dark surroundings. You can set the AF Illuminator to Auto or Off. Face Detection: Face Detection technology detects up to eight individual faces and controls flash, focus, exposure, and white balance to deliver accurate, natural skin tones with reduced red-eye. It can also give priority to children or adults. You can also select and register an individual's face to be given priority. When the Smile Shutter function is activated, the camera will automatically detect and shoot a smiling face. Scene Recognition: Scene Recognition mode operates in the Intelligent Auto and Superior Auto modes, and automatically detects ten different types of scenes and selects the appropriate camera settings: Portrait, Infant, Night Portrait, Night Scene, Backlight Portrait, Backlight, Landscape, Macro, Spotlight, or Low Light. The camera may also recognize whether the camera is on a tripod or moving (bright or dark surroundings), and if photographer is walking. Intelligent Auto: Allows you to shoot still images with the settings adjusted automatically. Superior Auto: Like Intelligent Auto, but also takes clear images in dark or backlit scenes. If necessary, the camera may shoot multiple images to create a composite image to record higher quality images than in Intelligent Auto. Program Auto: Allows you to shoot with the exposure adjusted automatically (both the shutter speed and aperture value). You can also select various settings using the menu. Program Shift allows you to change the shutter speed and aperture combination without changing the set exposure. Aperture Priority: You can shoot still images after adjusting the aperture setting manually. The camera will determine the shutter speed. Shutter Priority: You can shoot still images after adjusting the shutter speed manually. The camera will determine the aperture setting. Manual Exposure: You can set the exposure manually. The shutter speed can be set between 1/4000 and 30 seconds. The aperture (F value) can be set between F3.5 and F8.0 (Wide Angle) or between F6.4 and F8.0 (Telephoto). Memory Recall: You can store and recall often-used modes or numeric settings. iSweep Panorama: Multiple images are shot while the camera is moving, and these images are compiled into a single panoramic image. Movie Mode: Allows you to record Full HD XAVC S, AVCHD, or MPEG-4 movies with stereo audio. You can set the camera to Program Auto, Aperture Priority, Shutter Priority, or Manual for movies, if you desire more control. Scene Selection Modes: You can choose from the following Scene Selection modes: Portrait, Advanced Sports Shooting, Landscape, Sunset, Night Scene, Hand-held Twilight, Night Portrait, Anti-motion Blur, Pet, Gourmet, Beach, Snow, Fireworks, Soft Skin, and High Sensitivity. Exposure Compensation: Besides auto exposure, you can adjust the exposure from +3.0EV to -3.0EV in 1/3 stop increments. You can also adjust the exposure in a range of -2.0EV to +2.0EV for movies. Rear Synchro: The flash works right before the exposure is completed every time you trigger the shutter. This allows you to shoot a natural image of the trail of a moving subject such as a moving car or a walking person. Red-eye Reduction: The flash pre-strobes before shooting to reduce the red-eye phenomenon. You can set to Auto (when Face Detection is activated), On, or Off. Metering Modes: You can select Spot, Center, or Multi-pattern Metering. Spot metering lets you adjust the exposure to the subject, even when the subject is a backlit or when there is strong contrast between the subject and the background. Center-weighted metering measures the center of the image and determines the exposure based on the brightness of the subject. When multi-pattern metering is used, the image is divided into multiple regions and metering is performed in each region. The camera judges the subject position and background brightness, and determines a well-balanced exposure. White Balance: When the white balance is set to auto, the white balance is set automatically in response to the condition of the subject, and the overall color balance is adjusted. When shooting under special lighting conditions, you can select the settings manually. When using flash, you can select the flash white balance mode. The white balance can also be set to Daylight, Shade, Cloudy, Incandescent, Fluorescent 0 (Cool White), Fluorescent +1 (Natural White), Fluorescent +2 (Daylight), Custom (adjust white balance depending on the light source), Color Temp/Filter, and Custom Setup (memorizes the basic white color which will be used). Picture Effect: You can add effects to images with different effects, such as Toy Camera, Pop Color, Posterization, Retro Photo, Soft High-key, Partial Color, High Contrast Mono, Soft Focus, HDR Painting, Rich-tone Mono, Miniature, Watercolor, and Illustration. The original image as well as the retouched image can be saved. Creative Style: You can select a Creative Style to achieve a desired image. Examples include Standard, Vivid, Portrait, Landscape, Sunset, Black & White, and Sepia. You can adjust contrast, saturation, and sharpness for each Creative Style item. Histogram: A histogram is a graph showing the brightness of an image. The graph display indicates a bright image when skewed to the right side, and a dark image when skewed to the left side. Wi-Fi Overview: The Sony DSC-HX90V has built-in Wi-Fi so you can interface the camera with your smartphone or Wi-Fi-enabled laptop computer and wirelessly perform various shooting and playback functions. The camera also supports NFC (near field communication). PlayMemories Mobile: To interface with the HX90V, your smartphone must have the PlayMemories Mobile application. The app is compatible with iPhone, iPad, and iPod touch, and requires iOS 7.0-8.3 or later. It is also compatible with Android smartphones and tablets with the Android 4.0-5.0 or higher. NFC (Near Field Communication): By touching an NFC-enabled Android smartphone or tablet to the "N" mark on the left side of the camera, the smartphone will be connected automatically via Wi-Fi, and the PlayMemories Mobile app will be launched. The two devices must touch for approximately 1-2 seconds to make the connection. Smart Remote: You can use a smartphone as a remote controller for the camera. Still images shot via remote control are automatically sent to the smartphone's memory. You can also change some of the camera's settings, including EV, Self-Timer, and Review Check. Send to Smartphone: You can transfer still images to a smartphone for viewing. Images can be transferred in its original image size, or resized to 2M or VGA. RAW images are converted to JPEG format before being transferred. Send to Computer: You can transfer images stored on the camera's memory card to a computer connected to a wireless access point or wireless broadband router in order to easily make backup copies. View on TV: Images can be viewed on a network-enabled TV. View Modes: The Sony DSC-HX90V's View Mode allows you to select your recorded images and movies by sorting them into different views: Date View, Folder View (Stills), XAVC S HD View, AVCHD View, and Folder View (MP4). Index View: In addition to viewing images one-by-one in full screen, you can view multiple images at once in the index view mode. The index feature lets you to display a total of 9 (3 x 3) or 25 (5 x 5) images at once. You can also view images in the Calendar View which displays a thumbnail image on the shooting date. Slide Show: The Slide Show function lets you play back images one after the other. You can select playback of a specific folder, or all photos within a date range. The interval between photos can be set to 1, 3, 5, 10, or 30 seconds, and you can change the playback image size from HD to 4K (when connected via HDMI to a TV that supports 4K). When playing back on a Bravia TV, effects can be turned on to enhance playback. Playback Zoom: You can enlarge a recorded still image to get a closer look at the detail of the image. Once the image is zoomed, you can pan left to right and up or down through the image. Rotating Images: Recorded images can be rotated 360-degrees in 90-degree increments on the camera's LCD screen. Deleting/Protecting Images: You can delete a selected image, or you can delete all the unprotected images at once. In order to avoid accidentally deleting of an image, it can be protected. DPOF: You can mark recorded still images on a memory card for printing. This Print Mark is convenient when you have images printed at a shop that conforms to the DPOF (Digital Print Order Format) standard. HDMI: The HX90V has a micro-HDMI (Type D) output on the side of the camera for connecting the camera to an HDTV. A micro-HDMI-to-HDMI cable is required to make the connection. If you are connecting to a Sony Bravia TV with Bravia Sync, you can control the camera using the TV's remote control. The HDMI output resolution can be set to Auto, 1080p, or 1080i. When connected via HDMI to TVs that support 4K, you can set the output for still images to 4K playback. Multi/Micro USB : The camera features a Micro USB port for connecting the supplied USB cable to your computer for downloading your photos, or charging the battery in the camera. The interface is USB 2.0 High Speed compatible. Import images recorded on the camera to the computer. Play back images stored on the computer and the camera. Share images using PlayMemories online. Display images stored on your computer by shooting date on a calendar. Edit still images, such as resizing and cropping. Compatible Operating Systems: The "PlayMemories Home" software is downloadable from the Sony Imaging website. It is compatible with Windows 8/8.1, Windows 7 (SP1), and Windows Vista (SP2) operating systems. A version is also available for Mac OS X 10.7-10.10. XAVC S movies may not play back smoothly on a Mac OS. how to i view my pictures on a network enabled tv? Best to connect the camera directly to your computer by USB. Other options are complicated. would like an operating manual. can you get me one? need aperating manual. Thanks for your question. You can actually view/download the owner's manual directly from the Crutchfield website. On the main product page you'll see the section labeled "What's in the Box" and there will be a hyperlink for the owner's manual. Hope this helps. 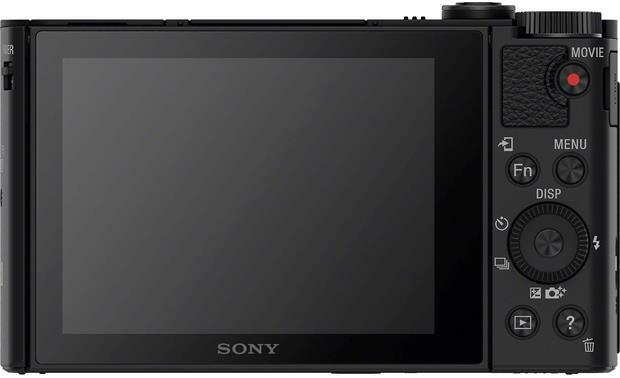 Searches related to the Sony Cyber-shot® DSC-HX90V 18-megapixel digital camera with 30X optical zoom, Wi-Fi® and GPS.